You'll probably find this to be an insane assertion, but I assure you that it has a solid rationale behind it. When the sequestration occurred earlier in the year, the aftermath was drummed up as being disastrous, perilous to the sputtering economy, predicted to affect unemployment adversely and slow down the much-needed growth in the GDP. Some or all of those things happened, but can you honestly say that you felt the pinch as dreaded? I did not.The stock market did well, salaries have not tumbled, heck, California has even rebounded to a surplus (temporary as it might be) after years of deficits. What did the sequester do? It cut spending by making arbitrary cuts in about equal measure from defense and discretionary spending. When it hit, both sides were lamenting the cuts to the defense sector, and one side was upset over the discretionary cuts. So coming into this budget fight, the goals for the Republicans were to cut spending to the areas they despised, restore defense spending, and get any semblance of dents made into Obamacare which is already law of the land. That is to maintain the sequestration level cuts, but by restoring defense spending at the expense of more cuts in discretionary spending. For the Democrats, the goals were to not budge on Obamacare (that is not lose what they had already won), restore all cuts made by the sequester, and balance restoration of discretionary spending with tax increases. So the Republicans started with wanting to restore defense spending, cut discretionary spending, not allow tax hikes, and dent as much of Obamacare as possible. The Democrats started with wanting to restore defense spending, restore discretionary spending (with tax hikes if needed), and...nothing. There was nothing to gain on Obamacare. Incidentally, the appropriation bill to fund the military already passed, with near-unanimity. So here we are on October 1, 2013, and the federal government has been shutdown without an agreement. Yet, both sides agree that the best Democrats will get is a clean continuing resolution if and when the shutdown ends. That is already a winner for the Republicans since Democrats agreed to it. So in the best scenario, Democrats get just one of the things they wanted, and the Republicans get at least two. The genius was in the strategy of dragging a law of the land on to the bargaining table when it was a foregone conclusion that no matter what, Obama would not budge on it. Getting the batshit fraction to bear the brunt of the criticism was beautifully finessed by Boehner, who at times evoked sympathy from his opponents at being boxed in. This is precisely what Boehner wanted. Any wrath faced over holding the country hostage would now be directed at this faction, especially with the real fight: the debt ceiling. To the base, he stands out as someone who did what the base wanted, and he can legitimately declare victory over getting the cuts. The Democrats got played. Obamacare was never a chip, yet the Republicans managed to make it look like it. The hoopla over public anger at shutting the government down will dissipate in a matter of weeks. Should the implementation of Obamacare stumble just a bit, they'll rail against it louder such that the focus will be on a "bad law that is a job-killer" all the way to November 2014. When the dust settles, the Democratic base will be wondering why the Democrats are celebrating when sequester level cuts are still in effect, but only over discretionary spending. 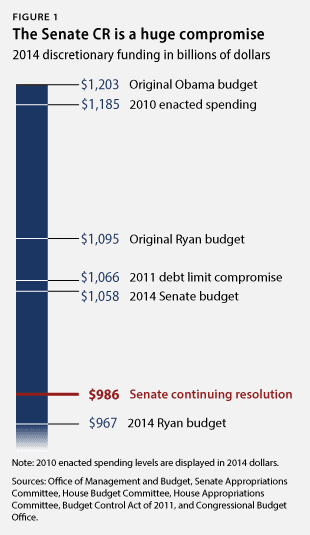 Of course, the Republicans can blow it by taking the debt-ceiling hostage, but I do not see that happening. Seeing how they shutdown the federal government, Wall Street would not be willing to take chances and will force Obama and Boehner to reach some deal. They will. Both are shrewd politicians. The only way Democrats salvage this politically is by taunting the Republicans into not raising the debt ceiling, or by ensuring that the shutdown does not end quickly. There are some trying to draw parallels between the aftermath of the 1996 shutdown and this one. The comparison is largely misplaced, thanks to the gerrymandering following the 2010 elections. Also, the 1996 shutdown was ended without a continuing resolution as favorable to the Republicans as this one. 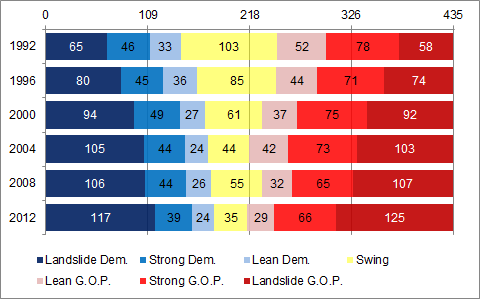 For the Republicans to lose, they must lose all of the swing districts and some more of the Lean G.O.P. ones, and the Democrats must sweep all of theirs.